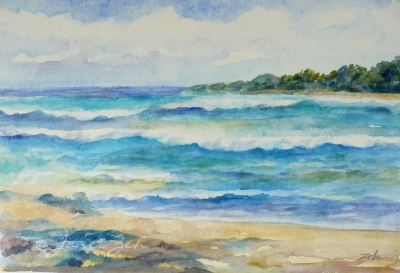 The surf crashes in at Turtle Bay on the north shore of Oahu in this plein air painting. I painted this impressionist watercolor on handmade paper while sitting on the beach overlooking this beautiful coral bay. An occasional misty rain gave a bit of a mottled look to the painting as I painted it, enhancing the texture already present from the handmade paper. So there is a bit of Hawaiian rain in this watercolor!